Dog hair tends to mat due to lack of grooming. Certain breeds are more prone to matting hair, especially if their hair is very soft and downy. The most common areas of matting are under the ears and the joints between the dog's body and its legs. If the mats are not combed out in time, they can mat all the way down to the dog's skin, causing it great discomfort and ultimately making it inhumane to brush them out without sedation. If your dog is severely matted, shaving may not be pretty, but it may be the kindest option available and it will allow you and your dog a clean start with regular grooming habits. Request permission to watch your regular groomer shave a dog if you are nervous. Dogs can sense your mood and can usually tell if you are nervous, so being calm when you shave your dog will help both you and your pet. Not only will watching help to relax you, you'll probably also pick up a few helpful tricks of the trade you can apply when you shave your dog. Ask a friend to help you if you know your dog is particularly squirmy or resistant to grooming. Place the No. 10 blade on your clippers and begin by shaving the dog's head. Be careful on the face, especially around eyes and ears. Stay at least 1 inch away from your dog's eyes with the clippers. Shave the dog's underarms and under-tail area with the No. 10 blade. Hold the clippers with the comb attachment flat against the dog's skin to prevent injury. Stop shaving if your dog starts squirming too much and wait until it calms down. Shave down the back of the dog from behind the head to the tail. If your dog's mats have reached down to the skin or close to it, leave the No. 10 blade on for shaving the whole body. If the mats are not that severe, you can switch to a slightly larger blade. Shave down the dog's sides and down the legs next. If the dog's fur is severely matted, the entire coat might come off in one piece like a sweater. Check the shavers for overheating regularly while shaving your dog, since they tend to overheat and could burn your pet. Shave your dog's belly last. After shaving, your dog may be itchy. 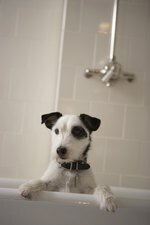 Give it a cool bath to rinse off the fur and calm the skin and try not to let it rub or scratch as doing so could cause hot spots.